Campaign for the American Reader: Pg. 99: Charlotte DeCroes Jacobs's "Jonas Salk: A Life"
Pg. 99: Charlotte DeCroes Jacobs's "Jonas Salk: A Life"
Featured at the Page 99 Test: Jonas Salk: A Life by Charlotte DeCroes Jacobs. When a waiting world learned on April 12, 1955, that Jonas Salk had successfully created a vaccine to prevent poliomyelitis, he became a hero overnight. Born in a New York tenement, humble in manner, Salk had all the makings of a twentieth-century icon-a knight in a white coat. In the wake of his achievement, he received a staggering number of awards and honors; for years his name ranked with Gandhi and Churchill on lists of the most revered people. And yet the one group whose adulation he craved--the scientific community--remained ominously silent. "The worst tragedy that could have befallen me was my success," Salk later said. "I knew right away that I was through-cast out." In the first complete biography of Jonas Salk, Charlotte DeCroes Jacobs unravels Salk's story to reveal an unconventional scientist and a misunderstood and vulnerable man. Despite his incredible success in developing the polio vaccine, Salk was ostracized by his fellow scientists, who accused him of failing to give proper credit to other researchers and scorned his taste for media attention. Even before success catapulted him into the limelight, Salk was an inscrutable man disliked by many of his peers. Driven by an intense desire to aid mankind, he was initially oblivious and eventually resigned to the personal cost--as well as the costs suffered by his family and friends. And yet Salk remained, in the eyes of the public, an adored hero. 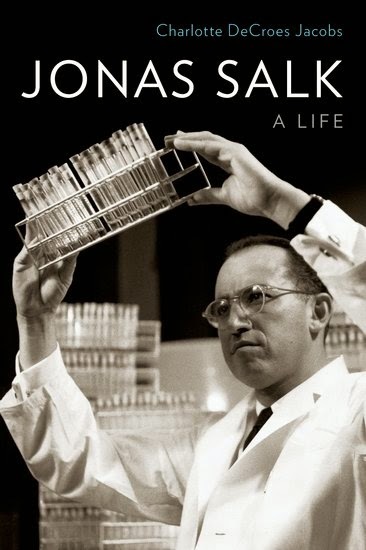 Based on hundreds of personal interviews and unprecedented access to Salk's sealed archives, Jacobs' biography offers the most complete picture of this complicated figure. Salk's story has never been fully told; until now, his role in preventing polio has overshadowed his part in co-developing the first influenza vaccine, his effort to meld the sciences and humanities in the magnificent Salk Institute, and his pioneering work on AIDS. A vivid and intimate portrait, this will become the standard work on the remarkable life of Jonas Salk. My Book, The Movie: Jonas Salk: A Life. The Page 99 Test: Jonas Salk: A Life.